Ice sculptures are an amazing thing of beauty and something that will captivate your guests. Whether it is a winter wedding or not, there is something about ice that lends itself to the elegance and glamour for an event. What is this amazement? It might be due to what can be created from a block of frozen water. Maybe part of the excitement stems from the fact that we know it’s only going to be there for a brief moment in time, a piece of art created specifically for your wedding, and will disappear at the end of the evening along with everything else. I am not sure exactly what it is, but it is FABULOUS! It is unbelievable what they can do with ice today. Not only can they sculpt ice into figures; such as love doves, hearts with the wedding couples initials, a dancing bride and groom, etc., but now they incorporate luge runs (where the alcohol is poured through a tract built into the ice). 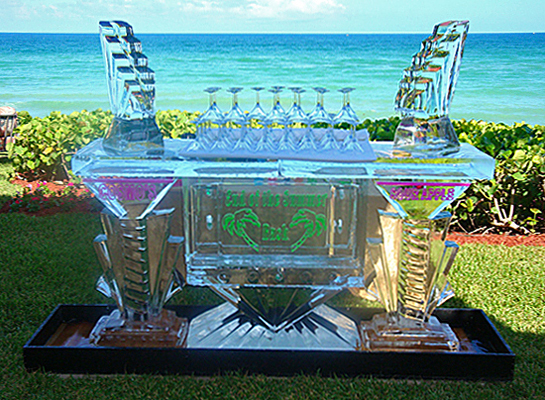 The size and scope has increased to the point that we not only have basic sculptures, but you can now get ice centerpieces for each of your guest tables, a complete ice bar or even an ice chandelier which is a work of art all on its own. If you want to add ice to your wedding celebration, check with Art Below Zero/Sculptures in Ice, in Zion, IL, or Nadeau’s Ice Sculptures in Forest Park, IL. They have a series of great ideas to choose from but can make custom order pieces as well. Whether you want that luge run for near the bar or are thinking something more elaborate, like a spectacular ice bar or even your head table made entirely of ice, this is the place to check out. For more Ice Sculptures plans and designs call the Windermere Elegant Wedding Team today 847-309-9478 and we will assist you in making your wedding spectacular!